With its somewhat derpy appearance, a guinea pig may sometimes look like it just stepped out of Pokemon! A lot of people may not realize it, but these cute, chubby-cheeked babies are so full of personality. In most western countries, domestic guinea pigs enjoy being one of the most popular “pocket pets.” They are popular for their docile nature and responsiveness towards feeding and handling. In fact, they are so popular that “insurance” for guinea pigs are also now available. This idea is slowly gaining support, considering that amongst rodents, cavies have one of the most extended lifespans. These cuddly creatures often live an average 4-6 years, but there are a few who can very well live up to 10 years! It means that you may need to take responsibility for them for a decade. 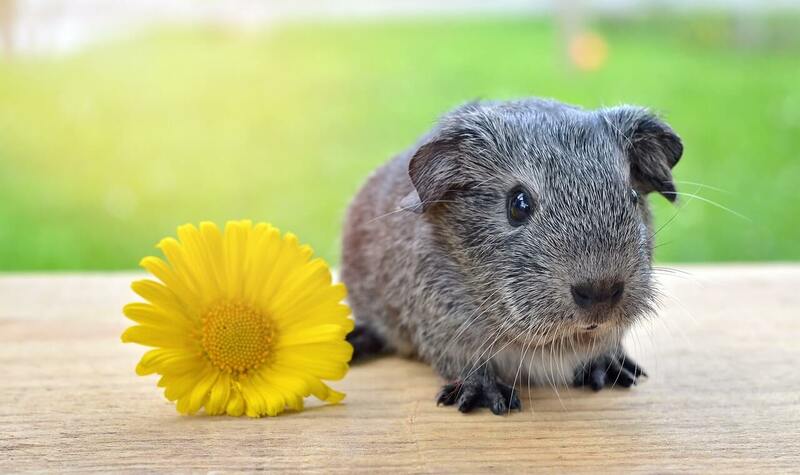 Whether you are a cavy owner, or first-time being a guinea pig parent or looking to add one to your household, it might do well to consider that before deciding to get one. So really, besides their cuteness, what makes guinea pigs so adorable? How do they behave with people? Do they bite? How do they interact with other animals? Are guinea pigs really friendly? How Are Guinea Pigs as Pets? How Are Guinea Pigs With Cats and Dogs? Just like us humans, cavies are brilliant creatures, and they respond well to those who care for them and provide for their needs. As long as they are correctly and carefully handled early in life, they are quite amenable to being carried or picked up, and rarely bite or scratch. When compared to the other members of the rodent family, the main difference is the fact that unlike rats, or mice, all of which are strongly territorial, cavies are more welcoming to other species entering their territories. If you have guinea pigs, you don’t need to worry about leaving them roaming around in the house. They are well behaved and will not chew away your stuff, your furniture, or your carpet. Well, on second thoughts, there might be one small thing you might need to worry about. Unless they are litter trained, you can expect a bit of poo or pee somewhere in the house. Cavies are fun, vocal, cuddly and fantastic companions. They have distinct personalities and can establish strong bonds with their owners. When this bond gets stronger, pet owners will gradually realize that their cavies become interested in them too. They will sometimes follow them around or pace the edges of their cage or run to check on what you’re doing. Since guinea pigs are docile and incredibly gentle creatures, they can happily get along with children of all ages. They naturally enjoy being handled by their owners. Most children love playing with their cavies on the floor, which is a great way to prevent accidental injuries to their guinea pigs. Bigger children often bond with their pet on their laps. Although guinea pigs are ideal pets for kids of all ages, a piece of advice is that only kids above eleven years be responsible for their care. Aside from the strange sounds they fondly make, it’s fun to watch how they play and compete with each other, exploring their environment, and just simply showing off their distinct personalities. It’s fun to watch one of them is being bossy, or affectionate, while another may be quite excitable. Overall, cavies are fun to be with. With a little stimulation, you can expect entertainment for hours. Because they are self-groomers, perhaps the only thing you need to take care of when caring for guinea pigs is to keep them well provided with clean drinking water, dry food, and a lot of hay. When it comes to hygiene, they only need occasional nail trims, and their cage needs regular cleaning. As compared to other pets, they don’t require excess training, walking, or vaccination. Pretty easy, right? Even though cavies are generally affectionate and friendly with humans, you might need to think twice about getting a guinea pig if you happen to have a cat or a dog in the house. No matter how cute they are, some animals still see them as prey. Guinea pigs will naturally feel stress and fear the more prominent species. Even when your dog or cat means no harm, their scent alone is enough to scare the guinea pigs. Although dogs, cats, and guinea pigs may accept each other as co-members of the household, their lifelong interaction needs constant supervision. It is because of their instincts for cavies to run, and for the dog or cat to give chase. So to protect your guinea pig, your presence is vital in case there is a need to restrain the bigger animals. If you intend to keep them in the same house, it would be wise to keep your guinea pig in a place that is not accessible to both your cat and dog. If not, you will have the bigger animals watching your cavy all the time. It can cause a lot of stress for you and your guinea pig. For guinea pigs to continue thriving and being happy, it is necessary for them to be in groups. You can at least have one companion for them. Solo lives don’t work for them. If you leave them by themselves, they will often end up gloomy, confused and generally spiritless. In the wild, guinea pigs come in herds, and this makes no difference even when they’re domesticated. One main reason that makes guinea pigs a popular choice for a pet is that of their friendly disposition. It is true that there is a little possibility of having a grumpy little guy in a guinea pig brood. However, chances are the majority of them will have a pleasant and friendly attitude. For someone owning or running a pet store, having a guinea pig available will surely attract a lot of visitors. As compared to other cuddly creatures, like the rabbit, cavies have an edge when it comes to consistency in demeanor. Rabbits may be helpful when young, but they tend to be temperamental as they mature. Guinea pigs, on the other hand, maintain their friendly disposition throughout their lives. They may grow old but will always be the same little lovable fluff.